Virgin Galactic displayed its spacecraft in development at a Career Day event on Sept. 7, 2013, at Mojave Air and Space Port in Mojave, Calif.
MOJAVE, Calif. – Virgin Galactic looks poised to begin launching paying passengers into space by 2014, but the private spaceship company is going needs more folks with the "right stuff" to make it happen. Enter the Virgin Galactic Career Fair, a weekend event that drew nearly 600 people to the Mojave Air and Space Port on Saturday (Sept. 7) from all over, seeking to build spaceships for Virgin Galactic founder, the British billionaire Sir Richard Branson. Virgin Galactic's SpaceShipTwo completed its second powered flight on Sept. 5, 2013 over California's Mojave Desert. This image was taken by MARS Scientific as part of the Mobile Aerospace Reconnaissance System optical tracking system. Virgin Galactic plans to launch paying customers on suborbital spaceflights for up to $250,000 a seat. The company's SpaceShipTwo spacecraft (the first one is called the VSS Enterprise) are designed to launch on short suborbital trips — flights that don't circle the Earth — from a huge carrier aircraft called the WhiteKnightTwo. Each SpaceShipTwo will be able to carry six passengers and two pilots. A Virgin Galactic T-shirt appears in the crowd at the company's Career Day event on Sept. 7, 2013, at Mojave Air and Space Port in Mojave, Calif. Applicants began arriving in the predawn darkness at 5:30 a.m. PDT. By the time the gate opened at 8 a.m., 120 people had gathered outside, a TSC official said. "It's a pretty exciting time for people to be joining us," said Enrico Palermo, TSC's vice president of operations. "There's a lot of work to be done, so we're looking for talented, passionate individuals." A Virgin Galactic employee interacts with visitors at the company's Career Day event on Sept. 7, 2013, at Mojave Air and Space Port in Mojave, Calif.
Palermo pointed to the rear of the giant TSC hangar, where a second SpaceShipTwocurrently under assembly was hidden behind curtains and dividers. The additional ship is needed to help fly the 630 passengers who have purchase tickets aboard the six-passenger suborbital space plane, he said. Virgin Galactic hopes to begin passenger spaceflights in 2014. 'It's really exciting right now," Palermo said. "You go on the shop floor and there's a real buzz. We're delivering real hardware." Law student Scott Szuhay flew in from Pittsburgh, Pa., on Friday, hoping to fill one of the more than 100 positions the companies have open. Most of the jobs are in Mojave, with a smaller number in New Mexico, where WhiteKnightTwo and SpaceShipTwo will fly out Spaceport America. "My life goal has to been to be someone in the aviation industry," said Szuhay, who has an undergraduate degree in aerospace engineering with a specialty in propulsion. "I've been reading about Virgin Galactic since I was a little kid, even before SpaceShipOne even flew [in 2004]. And when I saw there was a job fairs being held, I saw it on the website, I knew I had to come out here and talk to people and see these beautiful airplanes." Szuhay — dressed in a light gray suit, a crisp white shirt with no tie, and white tennis shoes — had a chance to chat with TSC Vice President Enrico Palermo, Virgin Galactic Chief Pilot David Mackay, and members of the engineering team. 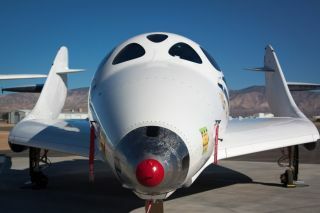 He was also able to view SpaceShipTwo and its WhiteKnightTwo mother ship, which were parked outside on the tarmac. David MacKay, chief pilot of Virgin Galactic, made an appearance at the company's Career Day event on Sept. 7, 2013, at Mojave Air and Space Port in Mojave, Calif. While Szuhay is just starting his career, Elsa Rogers came to the Mojave Air and Space Port with hopes of a mid-career change. An experienced engineer, Rogers has spent the last decade raising three children and running a software company in nearby Lancaster. Now, she wants to return to her first love, engineering. "Basically, wherever I fit in," Rogers said when asked what position she wanted. "What I like about this company is they encourage, where you can have a position but you can rotate to another one later on and move around, and everybody kind of has to know a little bit about the others." An attendee looks interested at Virgin Galactic's Career Day event on Sept. 7, 2013, at Mojave Air and Space Port in Mojave, Calif.
"What's really exciting about it is they're making history, and it seems like everybody that works here is really focused on the production of a good quality product, and that's what interests me. I'm a hard worker, so I want to work with people who have a passion for what they do, a passion for technology," she said. "I think I see the passion in the people that work here already, and that's what I like. I want to be part of that." TSC's Director of People Lisa Holden said the jobs fair was held to help fill a large number of positions that were recently approved. There are 250 TSC and Virgin Galactic employees now working in Mojave. Holding the event after SpaceShipTwo's successful and widely publicized test flight Sept. 5 was a big bonus, she added. "The timing worked out really nicely," Holden said. "You never know with test flights."